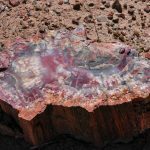 Post 103: Petrified Forest National Park, Az - A Snails Life and Lovin' it! 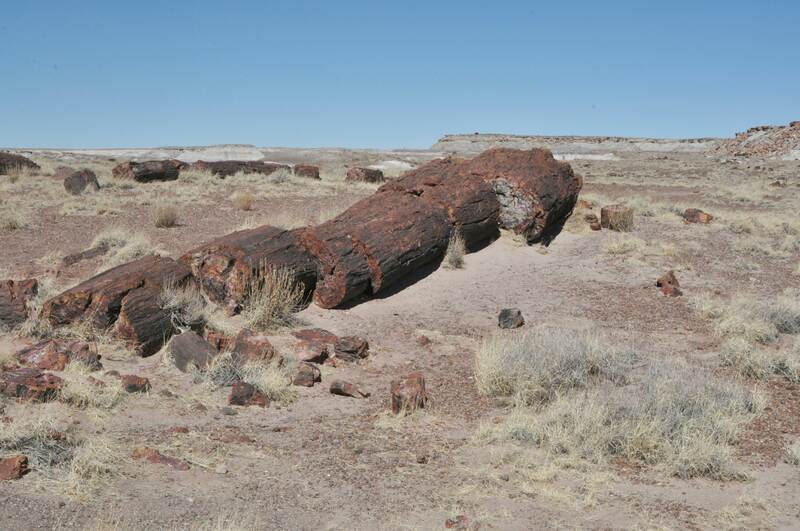 Our trip from the Grand Canyon South Rim was only a short one to the Petrified Forest National Park. 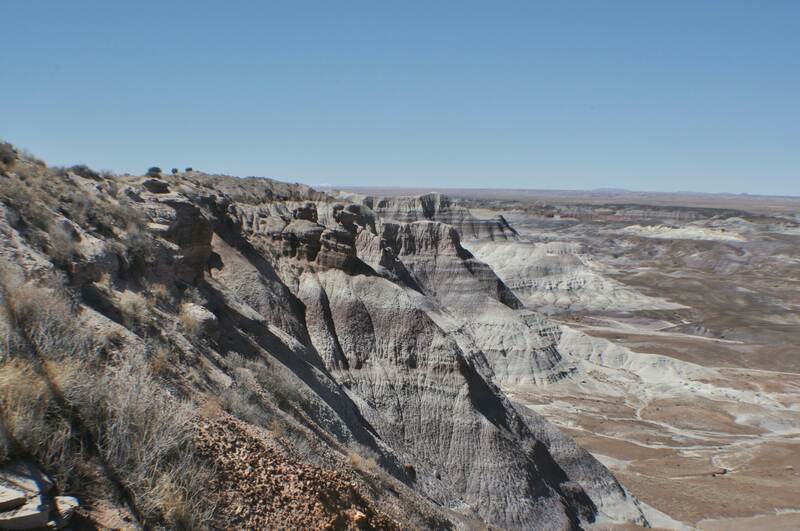 Bill knew in advance there was no camping in the Petrified Forest Park for RVs or trailers, only back country type camping. But we could camp right outside the gates for free. The parking lot beside two Museums/gift stores across from each other on either side of the entrance to the Park offered a gravel parking area. Some had picnic tables while others offered a cement pad. There was no water or electricity but FREE is always good to a self contained RVer . We snagged the prime spot we felt lol. Pulling in beside a covered picnic table (which we never got a chance to use, it was way too windy and cold lol). But that little building put some privacy between us and other folks and our front faced a field which was pretty to look at. We did take a drive through the park that same day to get a lay of the land and decide what we wanted to see. 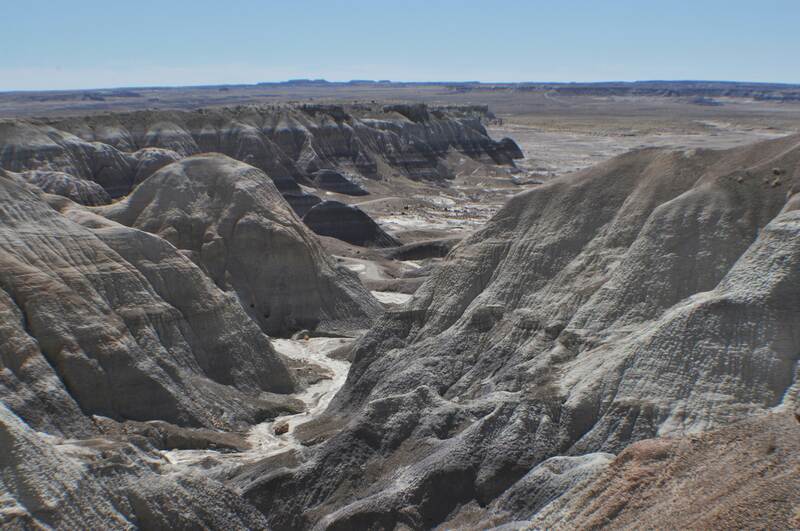 The Park is only 26 miles long with MANY great things to visit. Bill stopped at the first Visitor’s center and found an older park Ranger to chat with. Bill found this Gentleman was soo enthusiastic, lol. He took a news paper type map and highlighted the best things for Bill and Joy to see. Even told Bill where to park and what to do in a few places that most people didn’t know about. This made the next day more exciting to wake up to. Waking up to a beautiful sun shinny day, with very little wind was a bonus. Bill packed our lunch and we piled the dogs into the truck. This was one of the few parks that allowed dogs on the trail. You just had to pick up after them which was more than reasonable. We pulled up the gate as we did the day before and showed our AMERICA THE BEAUTIFUL – ANNUAL CARD. Again we got into a Park for free. This card has paid for it self more than once already. This purchase made us really glad we paid that initial $80.00 to buy this card, it has been money well spent. 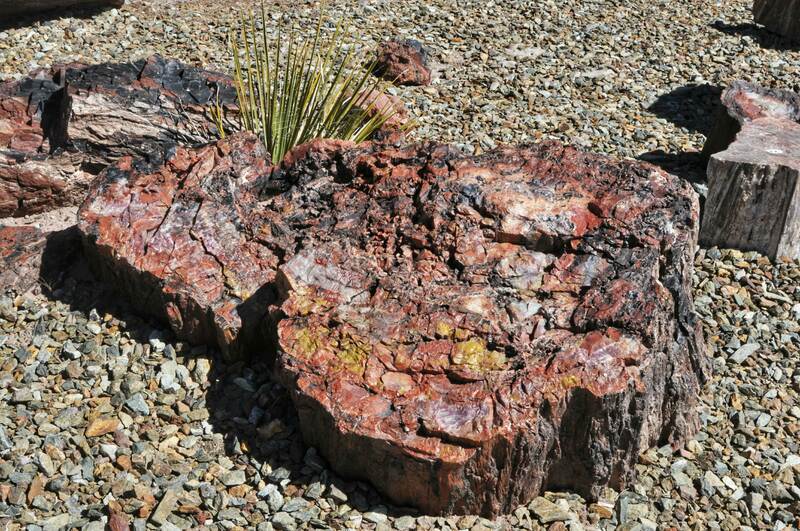 This shows the tree trunk and how is was split into pieces by the weight of the dirt over millions of years. Starting our trip off, we stopped at the first place of interest Giant Logs. 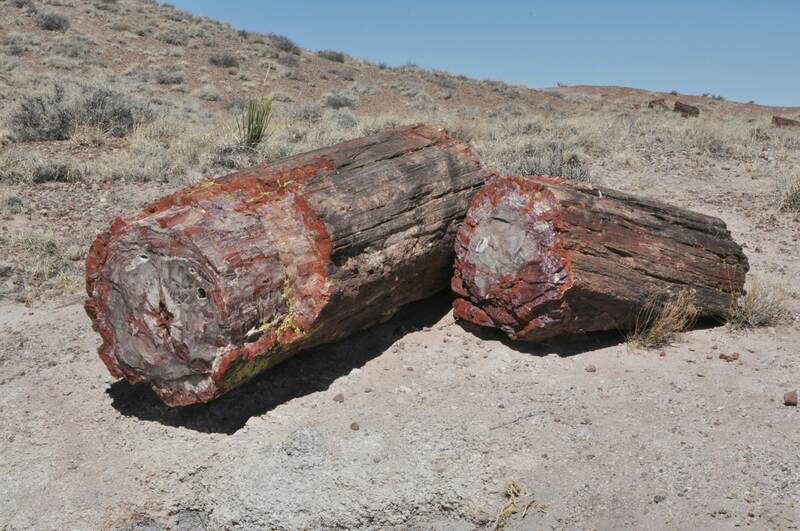 At this stop was the Rainbow forest Museum and the Giant Logs. The logs were outside the museum on a winding path that you could walk around. At the start of the path you picked up a flyer that walked you through each exhibit. The path was was only 0.4 mi long but was quite interesting. The museum was more appealing to other folks, not so much to us :). The museum held the study of paleontologist exhibits. 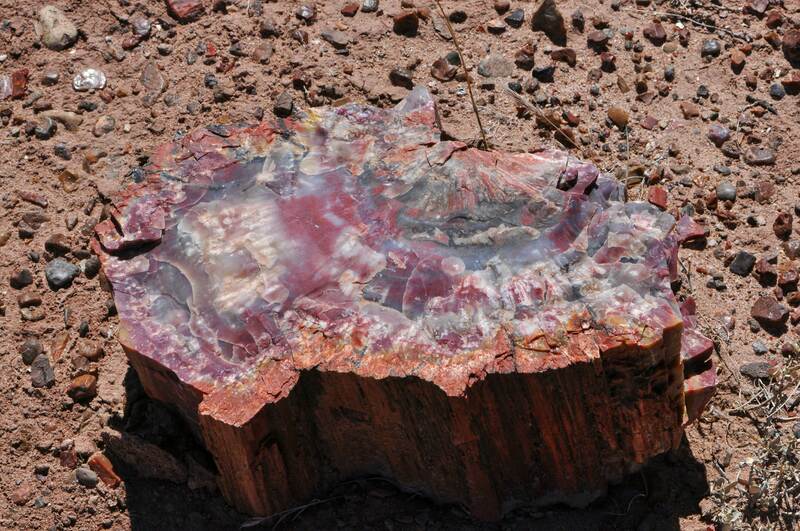 The amazing colours of Petridied Wood. THIS was both Bill and Joy’s favorite place of all. 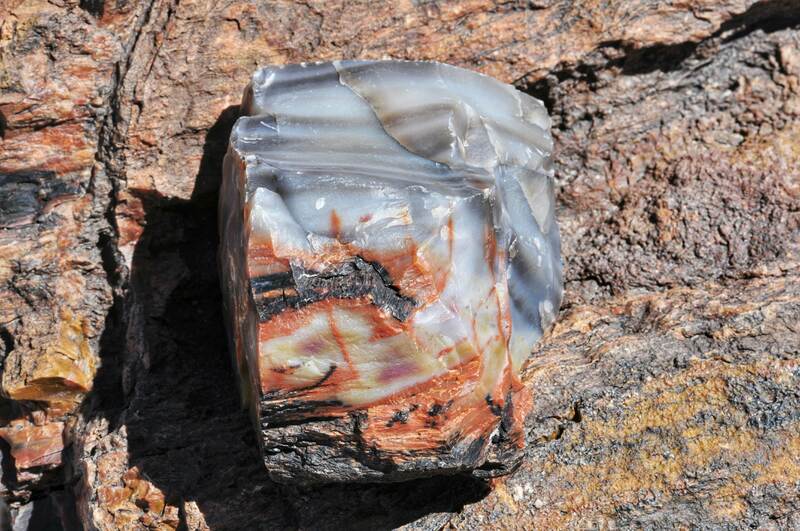 On this road you came to a panoramic view of an open area with a high concentration of petrified wood. The kindly old Ranger told Bill, about this place. You could take a 1 mile trail (which Bill and Joy did with the dogs). 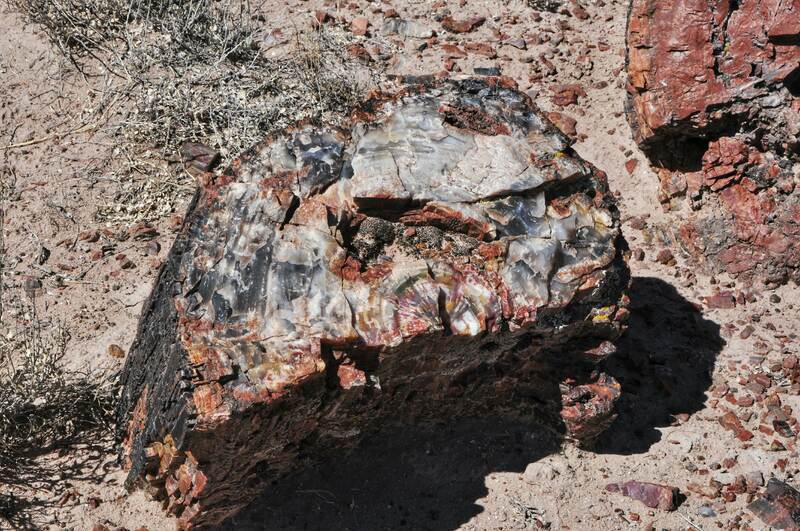 The trail brought you up close and personal with the petrified wood. The lay of the land in the valley allowed you to look up at all the mountains from the base in this area. Both the dogs and Bill and Joy enjoyed this hike, it was not difficult but was so impressive seeing all the wood where it lay and the various colours. Bill took a great deal of pictures here. This was a 3.5 mile loop that you could drive and was quite beautiful. There was also a 1 mile trail to walk. This loop had many vantage points to stop and look out over the verizon. All were very inspiring in colour and uniqueness. Bill did try to do the 1 mile trail, but near the beginning, it started off very narrow with drop offs on both sides. It did not take Bill long to decide this trail was not for him. 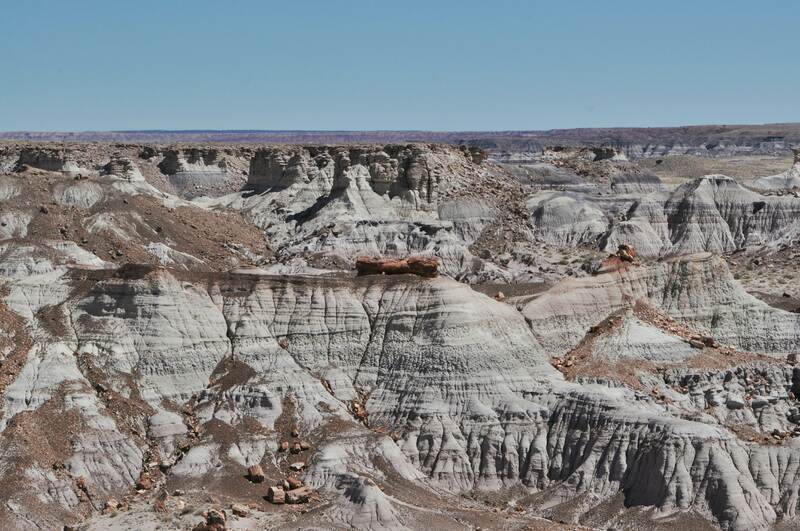 The last place we chose to visit was a pretty pink building called the Painted Desert Inn. This was once a trading post that was turned into an Inn. The Inn was then turned into a museum. The museum now offers exhibits on the Park’s recent history such as the small restaurant that was there complete with bar stools and tables and the menu with .15 items on it :). Also a cute little dining room with beautiful original hand carved tables and chairs from the same era. You enter the Inn from the Kitchen and walk through to the cafe area then into the dining room. There is another spacious room, with a stairwell leading to the down stairs. This was an interesting place to see but very small. 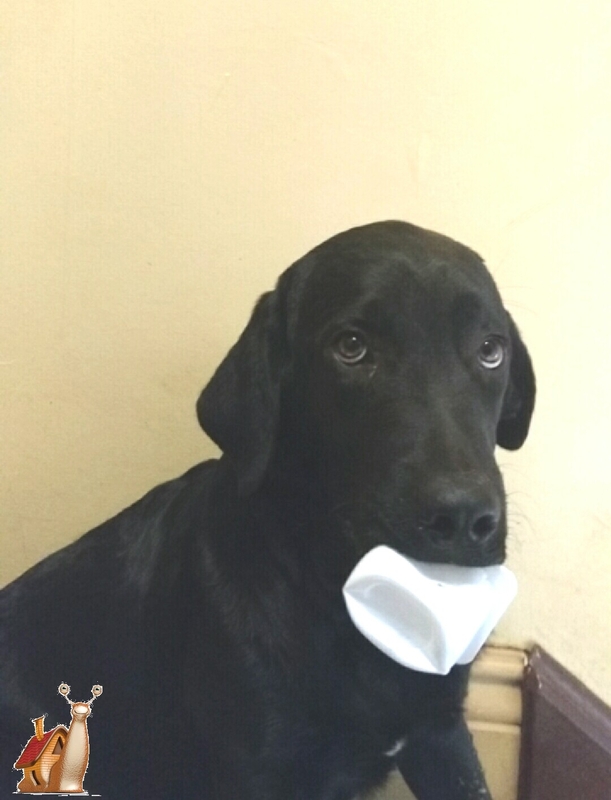 If you are looking for gifts or memories to bring home. We have always found that the gift shops in the National Parks are always quite reasonable. We have taken to buying books on each park and they are always less expensive than what you find in stores outside of the park. This goes for the magnets that we pick up for each special place that we visit lol. They always seem less expensive IN the parks than outside of the parks. The gift stores outside may offer different things, as well as the same items as the parks, so it doesn’t hurt to look in both places. But we suggest you check out the shops in the parks first if you are looking for such things :). Each colour relates to the mineral. 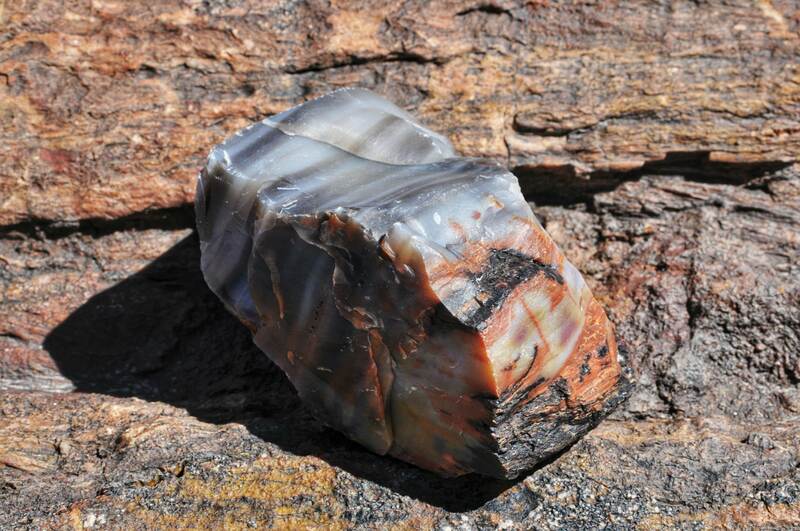 216 million years to turn a log into stone. 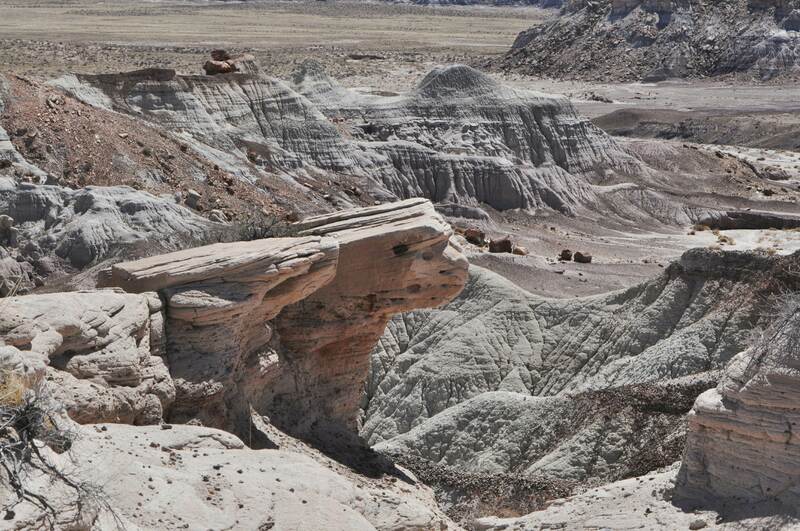 Blue Mesa, there is a 3 mile loop drive and a 1 mile hiking trail to explore the area in more detail. 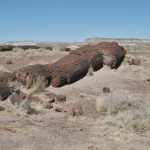 Once an intact tree trunk, it was buried beneath many, many stacked layers of dirt. The weight of the dirt crushed and broke the logs. 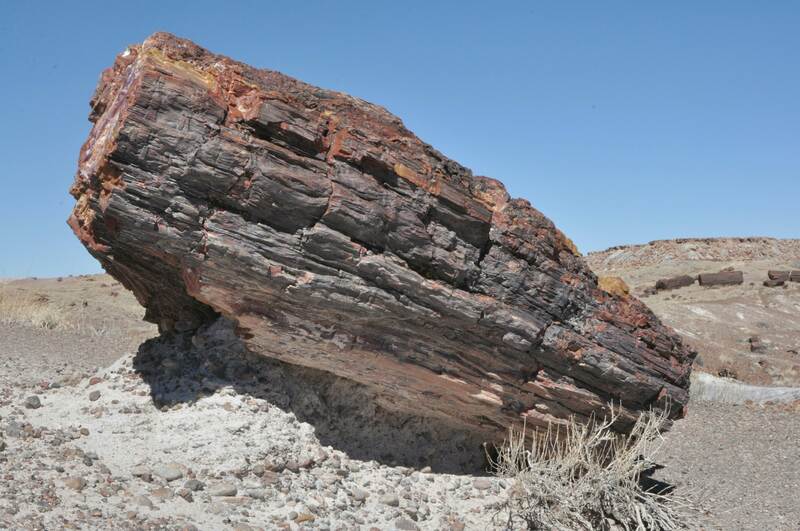 A petrified log purched on top of one of the hills. 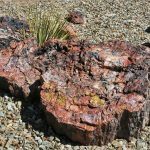 Rock formations and petrified wood in the background. It was beautiful. You and Ron had mentioned it was a worth a visit while we were at Midland LTVA area. We are glad we went for sure! Hi Terri. glad you are following and commenting!. We have been in Junction Texas the last few days, staying at Schreiner City Park! Thanks for the providing such a great facility! Blog comming soon. Bill and Joy. Love your photos! 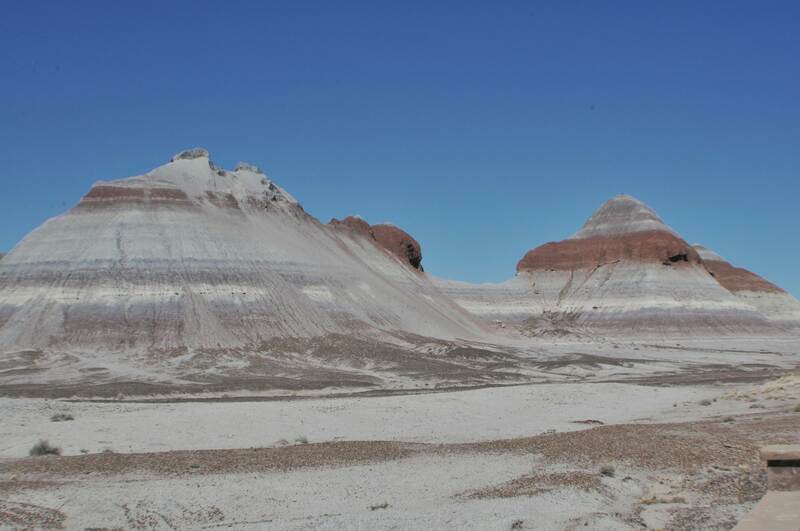 I am so glad that you were able to visit this park – amp her amazing place!